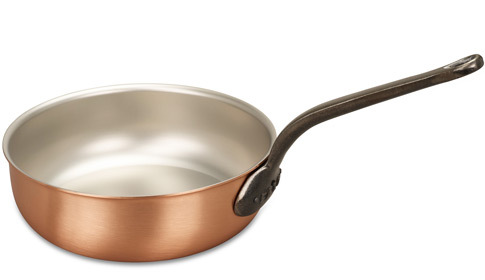 We know you'll love this	28cm copper saucier pan	as much as we do. Quality at its very best This is a magnificent pan. It looks the part and does the job. Its dimensions, materials, weight and sheer beauty make it a 'must have' in any discerning kitchen. I'd also like to say the customer service was A1 - receiving my order the next day - packed more than adequately and received in perfect condition. Smashing service. Excellent quality of goods. Highly satisfied customer. 912 customers found this review helpful. Did you? Yes, I did! A beast of a pan!!! I decided to buy this after seeing Nigel Slater cooking with Falk copper pans. This pan is HUGE and has many different uses. I love the extra handle on the front which makes it easy to move around even when completely full. The thick copper is a dream to cook with. Excellent build quality and easy to clean after use. Plus it looks great! 770 customers found this review helpful. Did you? Yes, I did! Heavy duty! This huge saucier is a really heavy duty piece of equipment, and has the capacity to deal with large jobs that other pans couldn't handle, like wilting large volumes of vegetables or leaves. The ability to heat it to a high temperature, combined with the high heat capacity of thick copper, also make proper stir-frying possible, without a super-powerful flame. 634 customers found this review helpful. Did you? Yes, I did!